James Foley, an American journalist who went missing in Syria more than a year ago, has reportedly been killed by the Islamic State, a militant group formerly known as ISIS. A YouTube video and photos purportedly of Foley emerged on Tuesday. The video — entitled “A Message to #America (from the #IslamicState)” — identified a man on his knees as “James Wright Foley,” and showed his beheading. 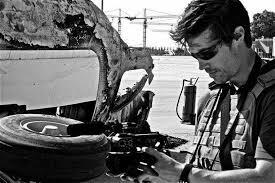 Foley was in Syria covering the country’s civil war when he went missing in November 2012. A May 2013 report from the Columbia Journalism Review said that he was likely being held near Damascus. American officials told the Associated Press that they believe Foley is the person shown in the video. They said President Obama was expected to make a statement about his death on Wednesday. The Committee To Protect Journalists condemned the killing, calling it “barbaric.” The press freedom group estimated that there are still around 20 journalists missing in Syria. Foley is at least the 70th journalist killed since the Syrian civil war broke out, the CPJ said. The video of the beheading was quickly removed by YouTube, but its horrific contents nevertheless spread widely around the Internet. The video also shows another man on his knees who is identified as American journalist Steven Sotloff. The Islamic State member says that Sotloff’s future “depends” on President Obama’s “next decision.” Sotloff, a freelance journalist, went missing in Syria in August 2013.